High blood pressure, also known as hypertension, does not usually have any signs or symptoms, but it can be diagnosed by having your blood pressure monitored. Blood pressure readings that are consistently 140/90 or higher indicate hypertension and a greater risk of heart attack, stroke, and even heart and kidney disease. There has been much interest in using natural remedies for treating hypertension. Scientific research have begun to expose ginger effects on blood pressure, but much is still unknown about the mechanism of action that allows ginger to actually control hypertension. High blood pressure can also have genetic causes or can even be a side effect of certain prescription medicines. Ginger can be used to improve blood circulation and relax the muscles that surround blood vessels. In animal models, studies have found that ginger's blood pressure-lowering effects are mediated by voltage-dependent calcium channels. For example, certain dosages of ginger extract have been associated with a fall in the arterial blood pressure, as well as with a decrease of muscle contractions. However, studies are inconclusive and further research is necessary to corroborate this benefit of ginger. It is important to consider ginger side effects and interactions before start consuming it for medicinal purposes. Because ginger may lower blood pressure, it is not recommended to take it with high blood pressure medications, as it may raise the risk of developing low blood pressure and irregular heartbeat. Eating fresh, raw ginger, as well as consuming dried ginger, drinking ginger tea, or taking ginger supplements, are all effective ways of reaping its hypotensive properties. However, it is not recommended that adults consume more than four grams of ginger a day in any form. Pregnant women should not consume more than one gram of ginger a day. Though ginger has a number of beneficial medicinal uses, and research suggests that it may have hypotensive effects, other herbs, such as garlic, are better suited to lowering blood pressure. Garlic is thought to aid in nitric oxide production, which results in smooth muscle relaxation and vasodilatation. Garlic has been linked to a decrease in blood pressure in patients with increased systolic pressure. Much research has shown garlic to have beneficial cardioprotective uses in addition to its hypotensive effects. Oftentimes, high blood pressure is a result of unhealthy lifestyle choices, and by simply changing the way you eat or the amount you exercise, your blood pressure can be lowered. 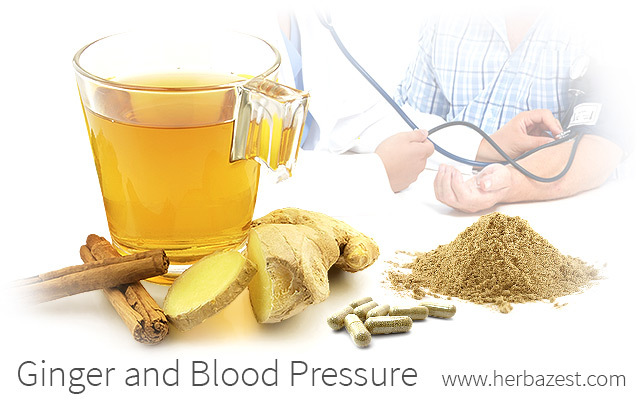 However, many natural herbs have been shown to have blood pressure-lowering effects. Since much is not yet known about the effects of ginger on blood pressure, you can include it in your diet, in combination with other herbs with hypotensive properties, in order to improve your cardiovascular health. Blood Pressure Association - U.K., What is high blood pressure?